Very early one rainy morning, I let my five dogs outside for their morning constitutional before breakfast. Only four came back inside. 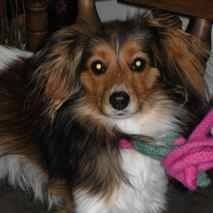 The Rosebud, a sheltie-cavalier mix (and my only good dog! ), was collapsed at the bottom of the steps. Raindrops were pattering on her beautiful silky coat as she rolled her eyes at me, unable to get up. I rushed her to the emergency vet, but she did not come home. An undiagnosed heart condition had reached a point where there were no good treatment options and I had to let her go. There were a few things that made the experience a little less painful. I knew the location of the emergency vet, so I didn’t have to try to find an address in my panicked state. I have a credit card just for pet care. And, most importantly, the emergency veterinary staff were kind and understanding, and didn’t blink an eye at a weeping middle-aged woman in pajamas rushing into the clinic with a dog wrapped in a blanket. Make a list of phone numbers and keep them in a handy – either contacts in your cell phone, or in an easily visible place at home, like the refrigerator door. You should include the phone number for your regular vet, the local after hours emergency vet, and a poison control for animals. The Pet Poison Helpline is available 24/7 for a $59 consultation fee. They also have resources on their site, and an email newsletter. The ASPCA poison control charges $65 for a phone consultation, but has lots of resources on their website. They also have an app available. There are also emergency web-based veterinarians and apps available. Make a list before you have an emergency. The American Red Cross has a free “Cat & Dog First Aid” online course to teach you the basics of emergency pet care. They also have an app available. The American Veterinary Medical Association has lots of good resources on pet care, including a “pet first aid supplies” checklist. All the supplies are readily available, and keeping them together is helpful in an emergency. The American Kennel Club is not just a site for pure-bred dogs. They have resources to help you choose the best dog for you and your lifestyle, an extensive video library on a plethora of topics, and lots of training advice. The Rosebud had an AKC Canine Good Citizen certification, and served as a “demonstration dog” for local CGC testing. The CGC test is 10 simple tasks – take a look to see if your good good dog can pass the test. The Dog Food Advisor is a public service website designed to help you make more informed decisions when buying dog food. You can also sign up to get email alerts for pet food recalls. The library also has books on veterinary care, pet health and training, the human-pet bond, and some books just for fun. Check out a list here. If I'm not librarianing, or chasing a dog around the yard, I probably have my nose buried in a book. I like all kinds of books. Regency romances - love 'em. Gory police procedurals - yes, ma'am. Historical fiction - please, and thank you. Heavy "literary" titles - shhhh, I may not have actually finished some of those! Off-beat, warped, slightly askew books - oh, yes, indeedy. Violent supernatural fantasy - why not? Chick lit, hen lit, lad lit - yeah, yeah, yeah. What have you read? Need a suggestion, or ten?